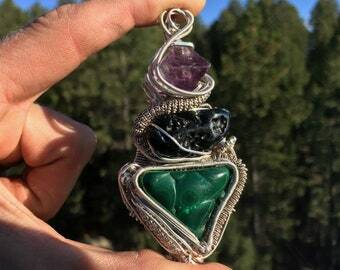 Wirewrapped Jewelery, gems, good vibrations. La "Flamaura" - Fire Agate, Tigers Eye, Herkimer Quartz, Beryl, Grape agate Wire Wrapped in Sterling Silver and 14/20 Gold Fill. The "Eyelandor" Quartz wrapped in Oxidized Copper. 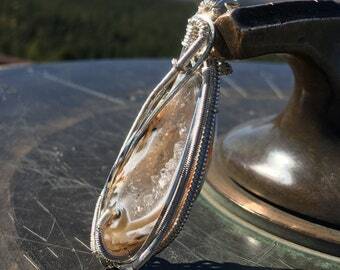 The "Raptrine" - Citrine wrapped in copper than oxidized. The "Tourmlinot" - Black Tourmaline wire wrapped in Sterling Silver and 14/20 gold fill wire. 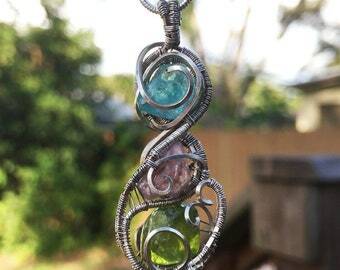 The "Infinando" - Lemurian Seed Crystal & Raw Citrine wire wrapped in Copper then Oxidized.